It is no secret that I am a big fan of Oppo phones. They are well-built with a premium feel and have great quality cameras. The new R7 Plus is no different. It is a beautiful phone, with an aircraft-grade magnesium aluminium unibody construction and sleek and slender curvy design that includes a 2.5D 6 inch screen. The standout features are an outstanding camera as well as remarkably long battery life. The R7 Plus is an upper mid range mobile phone. It is not considered a flagship device but comes equipped with solid specs. It features a full HD 6 inch AMOLED screen, octa core Snapdragon 615 processor with 3GB of RAM, a 13-megapixel camera with Schneider optics and a Sony IMX278 sensor and a 4100 mAh battery. In addition to these great features OPPO enhanced its spec list with a premium fingerprint reader, dual sim slots, expandable storage on top of the 64 GB internal storage and their state of the art VOOC rapid charger. Usually, it takes me about 2 weeks to get used to a new phone but the R7 Plus felt perfect right from the beginning. It is comfortable and easy to hold, not an easy task for a phone of this size. The screen is both large and bright, and I love the convenience of the fingerprint reader on the back for simple unlocking. The true stand out feature in my opinion, and the most impressive for me after extensive use is the battery life, allowing a full day of regular to heavy use on a single charge. The version I tested and evaluated is the international model of this phone. The LTE bands on this device are compatible with the Canadian bands but US compatibility is currently not available. The R7 Plus has a metallic body that both looks great and feels extremely durable. The 2.5D screen adds some curves to the rectangular shape. I love the golden brushed metal back. The bezels are minimal, the 6” screen is an edge to edge design with a thin black border around. Overall I find it to be slick and refined. The R7 Plus has a mid-range Octa-Core Snapdragon 615 processor and 3GB of RAM. In general, the phone feels smooth and responsive with no lag. I would not say this phone is blazing fast but for a phone of this class level, the performance is more than adequate. 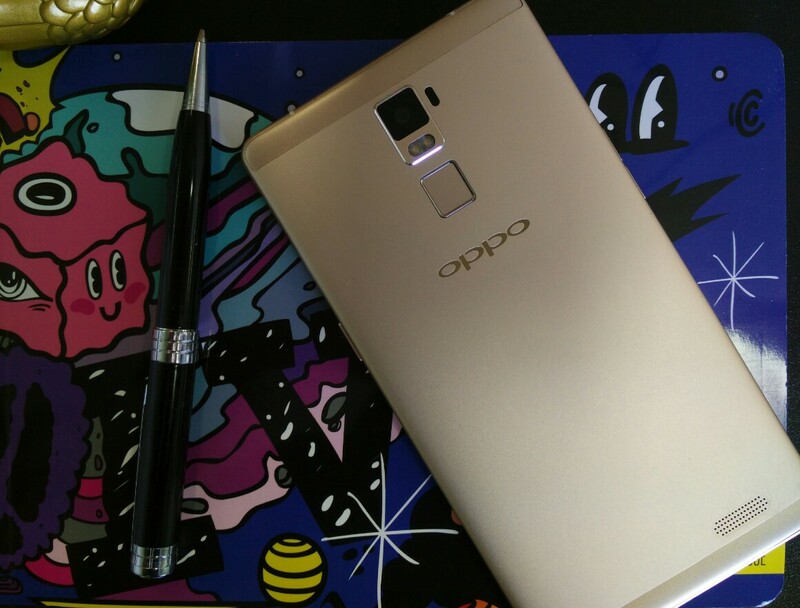 The OS is Oppo’s ColorOS V2.1.0 based on Android 5.1.1 lollipop. I am a fan of ColorOS, and I like the extra features like the screen gestures, the double tap motion to wake and the “one-hand use” mode for example. It is fast and smooth and doesn’t feel too overbearing. Oppo is known to have a great camera app and the same applies to the R7 Plus. The camera has great functions like manual mode, long exposure, gif, Ultra HD, beautify, filters, Super macro, RAW and more. The R7 Plus’s 13MP camera takes beautiful shots, not only in ideal conditions but also in low light settings. The laser auto focus is fast! It focuses immediately as I move the camera around to change the framing. I did notice some issues with its dynamic range in high contrast scenes. A bright subject, as the sky for example, will appear too washed out, or a dark setting will become too dark. I adjust the focus settings to avoid this problem. Despite that, the camera produces great photos with fine detail. A good camera is very important to me and the R7 Plus delivers on this front. The video recording is quite average. The phone takes 1080p videos at 30fps and has no optical image stabilization. It does have a time lapse option which is cool. The 8MP front facing camera produces good selfies even in dark conditions although it tends to overdo the beautify option if it is turned on. It can easily be turned off or adjusted though. The non removable battery is huge. At 4100 mAh it provides plenty of power and when compared to other phones I found the difference very noticeable. I was able to get more than 17 hours of battery life with regular use. The size, together with the VOOC rapid charge makes battery life a non issue. The phone has beautiful 1080 x 1920 pixel display on a 6 inch screen. This brings pixel density to a respectable 367 PPI. The colors look sharp and clear with great saturation provided by the AMOLED screen. Because of its size, it completely replaced my tablet when I am at home. Fingerprint scanner - The fingerprint scanner unlocks the phone perfectly. It is very reliable and rarely fails. Up to 5 fingerprints can be programmed, I programmed both hands so I can unlock it no matter how I hold the phone. Unfortunately it cannot be used to snap a photo. I miss that option from the Oppo N3. Dual sim - I travel often so for me it’s an amazing feature. Both sim slots support LTE. But, as I mentioned above, I have the international version, so the LTE is not supported when I travel to the United States and that is a shame. The sim card tray can either be used for 2 sim cards or a sim card and a microSD card. Rapid charge - I am addicted to the VOOC rapid charge. I already experienced it on my Find 7 and N3 and I cannot live without it. Even with the big battery, the charging is extremely fast. It allows you to charge your phone to 75% capacity within 30 minutes. Speaker - A single speaker is located on the back of the device and is quite average. -The phone design lacks originality, it is very similar to the iPhone 6 Plus and Huawei Mate S. The camera app UI also resembles the iPhone's. -Mid range processor and only 3GB of RAM. I feel like they could have done better than the Snapdragon 615. -Video and audio quality are average. -No NFC. I don’t get why it was not included. I don’t use NFC on a daily basis but with Mobile payments finally becoming more popular, it feels like an odd choice to omit that feature. The R7 Plus is a great option for those who like big phones and want to buy an unlocked phone for a reasonable price (currently it is priced at $499 USD and includes a phone case, earphones and the VOOC fast charger). The camera quality is great, battery life is outstanding, and it offers some great extras like the fingerprint unlock, micro sd card slot and dual sim. Batch 2 pre-orders is open. Orders will be shipped around the 3rd week of October 2015.